Finally getting himself out of the courtroom and into familiar environs of a football stadium, Harry “I’m not a wheeler-dealer” Redknapp no doubt enjoyed seeing his charges stroll to a 3-1 victory against Wigan. But just what was the Tottenham boss saying under his breath after noticing that ‘the filth’ were in his manor, keeping an eye on him? Police: Just doing my job… keeping hooligans off the twi… I mean pitch. 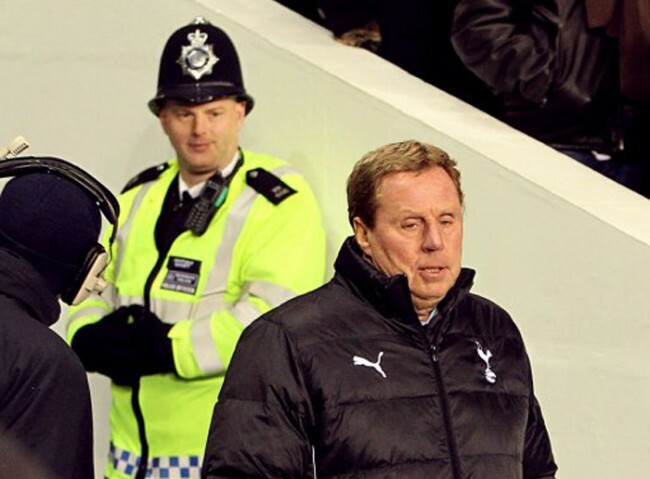 Sayyy Mr Redknapp, that jacket seems awfully well padded there. How dare you not pay my wages! @ Andy Carroll’s Ponytail. HA! winner!